San Francisco's SFPark trial has raised the profile of performance-based pricing for on-street parking (see a video on this at the end of this post). What is the right price of kerbside parking in a busy shopping street in a city? And how can we tell when we have the wrong price? The price is too low if there are no empty spots, so most motorists take a long time to find a vacant parking place. The price is just right if there are just enough vacancies so that most people can find a park very quickly (zero search time). And the price is obviously too high if a large number of vacancies can be seen. They were actually working out for themselves (with a little guidance) the principles of 'performance-based parking pricing'. This innovation has been emerging recently at the urging of UCLA Professor, Donald Shoup. He didn't invent this approach to pricing but Prof Shoup has been vigorous in promoting it and it is a key component in his wider set of parking policy proposals. We can call this balance between demand and supply the Goldilocks principle of performance-based parking prices: the price is too high if many spaces are vacant, and too low if no spaces are vacant. When a few vacant spaces are available everywhere, the prices are just right. 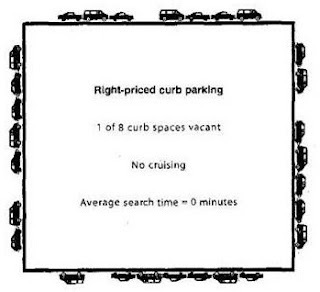 If prices are adjusted to yield one or two vacant spaces in every block (about 85 percent occupancy), everyone will see that curb parking is readily available. In addition, no one can say that performance-based parking prices will drive customers away if most curb spaces are occupied all the time. New York's StreetFilms produced a great 5 minute on-line video to illustrate these ideas in 2008. 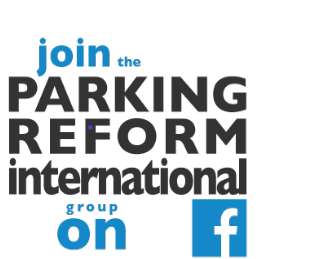 Last month, SFPark brought out a wonderfully clear video explanation of performance-based parking pricing. Scroll down to see the SFPark video. My guess is that this approach to pricing should be relevant almost everywhere, including parking-scarce Asian cities. In fact, the idea does not just have to apply to on-street parking. It could also be used for off-street parking that is owned by municipalities and governments. Does anyone know of any attempts to price parking in this way anywhere else besides the current American trials? I think Taipei's approach may come close but the prices don't vary much across the day. Any others? Would this be legal to try in your city? Here is the SFPark video in case you haven't seen it yet. Price that always produces the occupancy rate of 80% IS NOT always correct. Sometimes it is not good to charge price that is too low since the increase in occupancy does not always offsets the lost revenue.